Main content for "Month: February 2018"
Roshmond “Sum” Patten is a seasoned hip-hop artist, and digital media/marketing professional with over 15 years’ experience. As an artist, he manages an independent music career that features an eclectic body of work, with an indomitable DIY ethic. Professionally he is a creative-for-hire, working on a variety of projects ranging from being the Twitter voice for Donald Glover’s hit TV show Atlanta, to acting as lead strategic partnerships consultant at Stampede Management, and helping Apple Music refine their music discovery algorithm. Sum has served as Music Director for IndieCade International Videogame Festival and is currently on the Advisory Board for Overbrook Entertainment’s mobile app developer, Buzznog. He is currently building out the Digital Action Committee concept, a collective of creatives building awareness campaigns and digital tools for modern activism. Topics the collective approaches include closing the digital divide, leveraging the individual/organizational digital footprint, and creative approaches to constructivist tools. VT Publishing and Virginia Tech Libraries are excited to share a new Digital Humanities project, Redlining Virginia. The project is based on a physical exhibit that was held in the Newman Library at Virginia Tech from December 7, 2016 to February 17, 2017 and is part of a larger project, Mapping Inequality, a collaboration of three teams at four universities, including the University of Richmond, the University of Maryland, Johns Hopkins University, and Virginia Tech. Mapping Inequality provides access to a collection of “security maps” and descriptions created by the Home Owners’ Loan Corporation (HOLC) between 1935 and 1940. These maps and their corresponding descriptions used a color-coding system to assign risk levels to different areas within a city which were often based on racial lines. As a result, they changed the course of real-estate practice for over a century. Redlining Virginia was created using Omeka by LaDale Winling, in the History Department, with Eleanor Boggs and Nicholas Bolin. It pulls together HOLC maps from popular areas in Virginia to show the impact on Virginia Cities over time. For more information on Mapping Inequality, please see this VT News Story. Please join us for an exciting event! 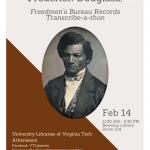 Athenaeum is participating in a national, synchronous celebration of Frederick Douglass’ birthday featuring a document transcribe-a-thon of the Freedmen’s Bureau Papers in collaboration with National Museum of African American History and Culture, Smithsonian Transcription Center, and Colored Conventions Project. An event flyer is attached here. Spillover locations: Athenaeum Collaboration Room (Newman 126) & Torgerson 3310 Classroom. National event planners have encouraged participants to visit the Smithsonian Transcription Center web site to register, view tutorials, and familiarize themselves with the tools ahead of the Douglass Day event. In order to provide additional support for the event, our FlowGround time on Monday, February 12, 11:30am-1:00pm will be dedicated to STC transcription orientation. Please do feel free to forward any questions, share the event as broadly as possible, and I hope you’ll join us for this terrific opportunity. 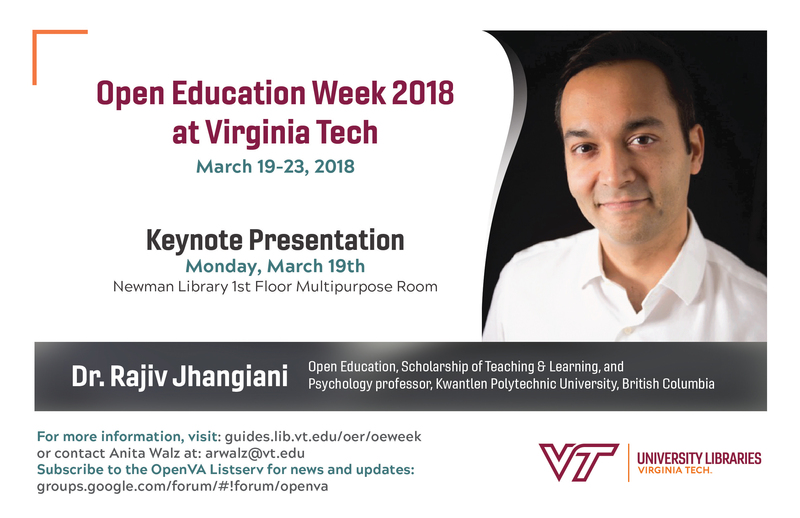 We are pleased to welcome Dr. Rajiv Jhangiani to Virginia Tech as our Keynote speaker for Open Education Week. More information about the all-day event schedule and free registration is forthcoming at: http://guides.lib.vt.edu/oer/oeweek . Please SAVE THE DATE! and please share broadly.